The earliest drawing anybody can remember Charles Schulz making depicts a man shoveling snow in a howling blizzard. Out of a nearby snow-drift grows a tropical green palm tree. Not a bad gag for a kindergartner. But it's more than a gag; it's a self-portrait of a paradoxical person. Schulz was a sad man who made jokes for a living; a kind, Midwestern man who held life-long grudges; a loving man who cheated on his wife; a man who drew a comic strip for 50 years, who had every kind of success but who still felt unknown and overlooked. 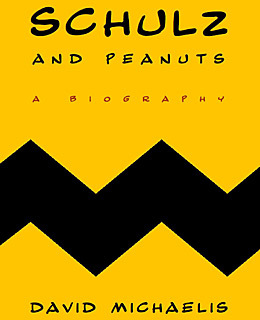 October's Schulz and Peanuts (Harper; 672 pages), by David Michaelis, who also wrote a biography of the artist N.C. Wyeth, is an extraordinary achievement: sympathetic and unsparing and rigorously knowledgeable, a book that simultaneously shrinks Schulz down to human size and enlarges our love of his work. As Schulz himself said, "A normal person couldn't do it."